NetVirtue Review 2019: Is NetVirtue a Good Hosting? Net Virtue is an Australian web hosting provider established in 2011. They own and operate their own network as well as servers located in Sydney, Melbourne, and Brisbane. Featuring high-performance SSD servers and a resource booster to handle surges in traffic, Net Virtue offers beginner-friendly shared hosting plans. The Australia-based company also has a range of VPS, reseller, and dedicated server hosting packages, so you can safely and easily scale up your hosting as your business grows. Net Virtue boasts a range of shared cPanel, VPS, reseller, and dedicated server hosting packages. This variety means that small websites that start out with Net Virtue can scale up their plans as their needs grow. The free SMS credits are a unique perk; Net Virtue offers this in every shared and reseller hosting package. Note that none of the Economy plans include a free domain registration, so you’ll have to purchase this elsewhere. All shared cPanel hosting plans feature the LiteSpeed Web Server, which runs up to nine times faster than your usual Apache Web Server. You also have access to their website builder, a one-click installer with 100+ applications, free daily backups, and multiple server locations across Australia. User reviews on the performance of their shared SSD servers are mixed. Several report that they experience much faster loading speeds after moving to Net Virtue, but a few with WordPress installations say that their websites have become noticeably slower over time. This may be attributable to WordPress’s open-source configuration and many third-party scripts. Their Business cPanel plans take your hosting a notch higher. This comes with a 99.99% uptime SLA, along with 24/7 priority support and 75% fewer accounts than Economy shared servers. The Personal plan is designed for startups and affords 5GB storage, unlimited bandwidth, unlimited email accounts, unlimited MySQL databases, and a free SSL certificate. You still have access to their WYSIWYG website builder, so you can launch your business website quickly and easily. Plus, all Business plans come with a resource booster, which allows you to double your resource limits during peak traffic periods up to three times a year. (If you’d like to keep it permanently boosted, you can do so for an additional fee.) Like the Economy plans, you have a choice of server location (either Sydney or Melbourne), so you can choose what offers your customers the lowest latency. Net Virtue’s Economy cPanel plans offer the best value for money given the resources and features included. Not many web hosting providers will offer you SSD storage and LiteSpeed Web Server in that price range. However, if you’re planning to start an online store or a content-rich content website, the Economy plans will be inadequate. For one, they don’t include SSL certificates. With only a 99.5% uptime SLA, customers will be less than pleased with the availability of your website. You’ll have to opt for their Business cPanel plans instead – but while these are still affordable, they aren’t the most inexpensive in the market. The one advantage you will have is that Net Virtue’s servers are hosted in Australia, so if your customers are located there, you’ll get better loading speeds compared to a web host located in North America or Europe. The level of support you get depends on the plan you choose: Business plan customers are given a higher priority than Economy plan customers. That said, even on the Economy plan, their support team is still highly responsive. On most occasions when I submitted a ticket, they got back to me within 10 minutes. 24/7 support is available via phone, a ticketing system, and email. They also have a live chat, but this is only open during Australian business hours Monday through Friday. 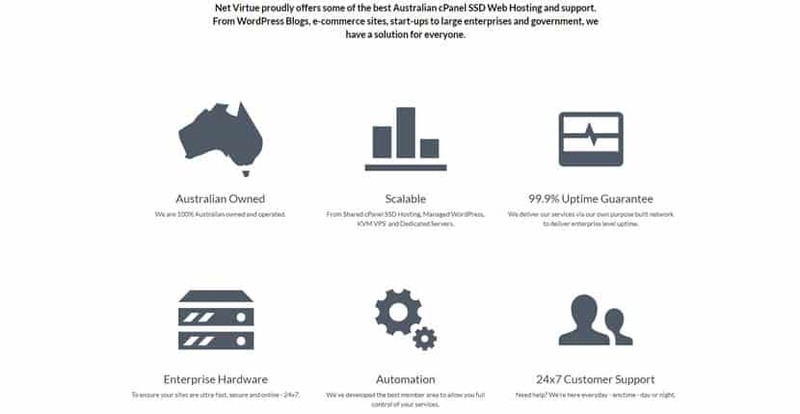 Net Virtue is a reputable and high-quality hosting provider for the Australian market. Their plans can be a little pricey for business customers, but the feature set offered makes the higher price tag worthwhile. Wondering how NetVirtue stacks up against other Web Hosting companies? Enter any other Web Hosting company and we will give you a side-by-side comparison.